Six months have flown by and now that summer’s over and I’m 15lbs heavier with a belly out-to-here, we’re just about in countdown mode for Peach’s arrival. Everyday, Nora tells me, “Wow, Mama, your tummy is getting really, really big!” and perfect strangers now feel comfortable asking me when I’m due and what I’m having — a question which occasionally still throws me off in moments I’m busy enough focusing on Nora that I forget there’s another human sharing my body. Those moments of forgetfulness will soon be far behind us, though, as our excitement grows along with baby Peach’s ever more frequent kicks and rolls. This baby is already making sure his/her sister doesn’t get all the attention: anytime I sit down to read with Nora, Peach starts dancing behind my belly button, and the last few nights, lying curled up with Nora on her bed, I’ve felt the first few fingers of heartburn crawl their way up the center of my chest. Even with moments of discomfort, I’m getting more and more excited about meeting our little Peach, especially now that we’ve finally sorted out the home versus hospital birth decision. In the last month, we were happily able to commit to homebirth, thanks to the incredible generosity of our friends and family. I tried my hardest to get our insurance to make an exception and pay for at least part of my prenatal, birth, or postpartum care to no avail (that would be the downside to having state subsidized Commonwealth Care). And just when I thought that there was no hope in sight, just when I was entertaining crazy notions (like “What if I have an “accidental” homebirth and just call the paramedics to show up at the last possible moment so it won’t be an unassisted delivery, but then refuse to go with them after Peach is born”), just when Chris and I were getting incredibly discouraged about our finances and what they mean for our birth choices, two amazing things happened. My dad’s mom called me out of the blue and surprised us by saying she wanted to help pay for our homebirth, and my amazing friend Jess offered to throw me a baby shower/fundraiser, enlisting the help of my friend Caitlin who generously offered to teach a free yoga class as part of the fundraiser event. Between my grandmother’s amazing offer and Jess’ optimism about fundraising, Chris and I started to think we might actually be able to have the birth of our dreams. she reached out to women far and wide, and, along with Caitlin, put together an incredible celebration of motherhood and birth in celebration of Peach. 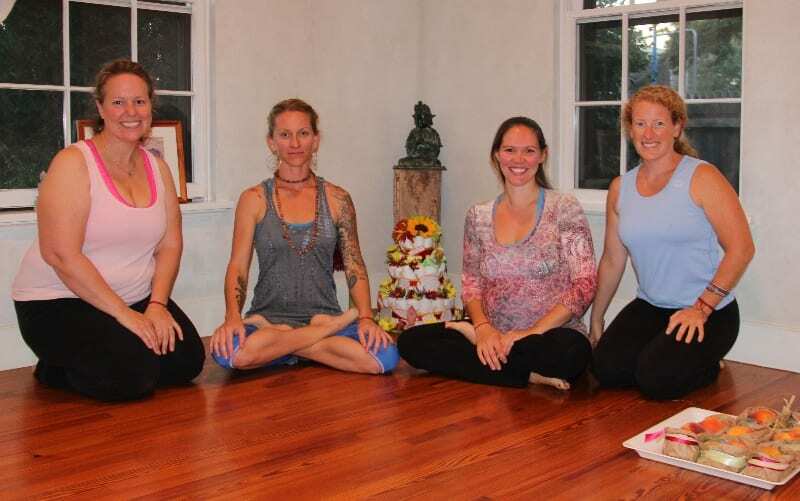 On Saturday evening, I walked up to the yoga room excited and unsure of what to expect. There, I saw beautiful decorations honoring pregnancy, birth, breastfeeding and sweet, delicious babies. Jess had thought of every little detail, right down to an amazing diaper cake and peach party favors. Clearly, Martha Stewart has nothing on Jess’ party planning and hostess skills. 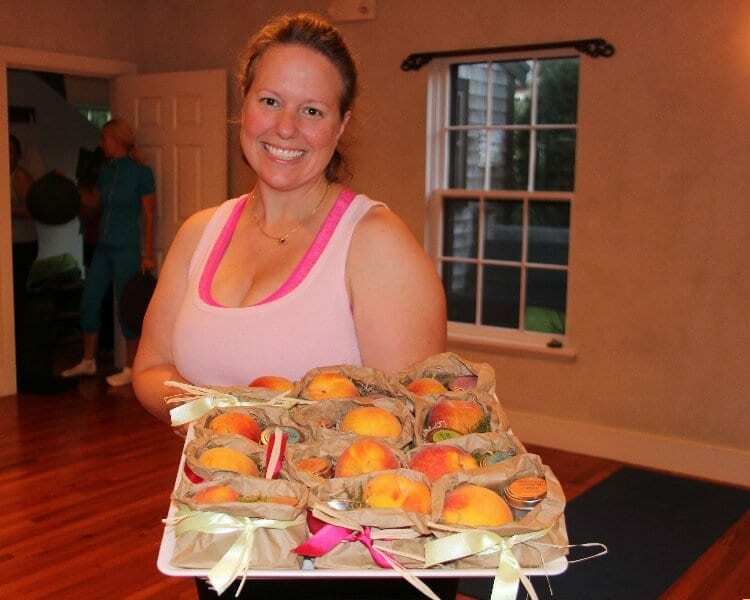 Also waiting for me at the Yoga Room was a circle of women, all of whom were thrilled to help celebrate Peach and share their supportive joy for our homebirth plans. Sunny, my friend and our doula, started by having us pass red yarn around our circled yoga mats, each of us naming our mothers and their mothers before them for as many generations as we could name, until the yarn had made a complete circle around the room linking each of us and our mothers, grandmothers, and great grandmothers together as a community of women. Then we each cut our piece from the circle of yarn and tied it around our wrists to be worn until after Peach is born, as a symbol of our connectedness and their support through my birth journey. 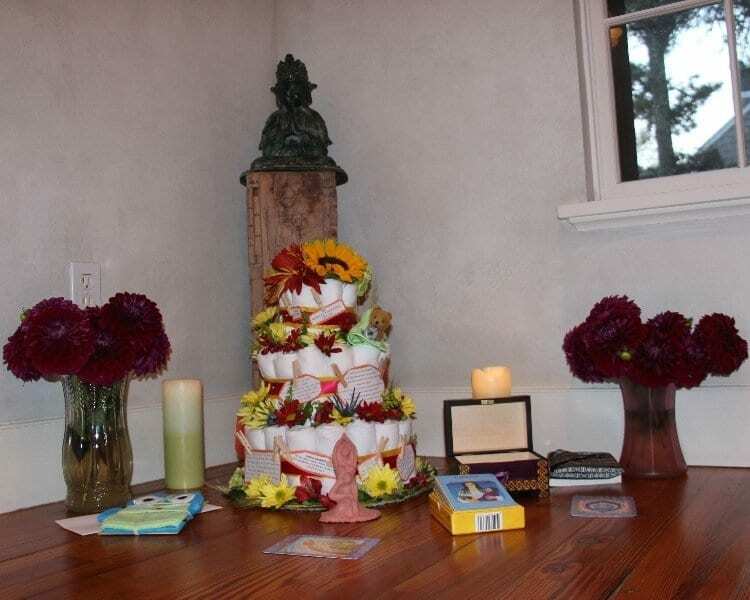 It was the perfect opening to the goddess flow yoga and meditation practice through which Caitlin guided us. By the time I got home and had a chance to really look at the diaper cake Jess had made, I was teary-eyed. 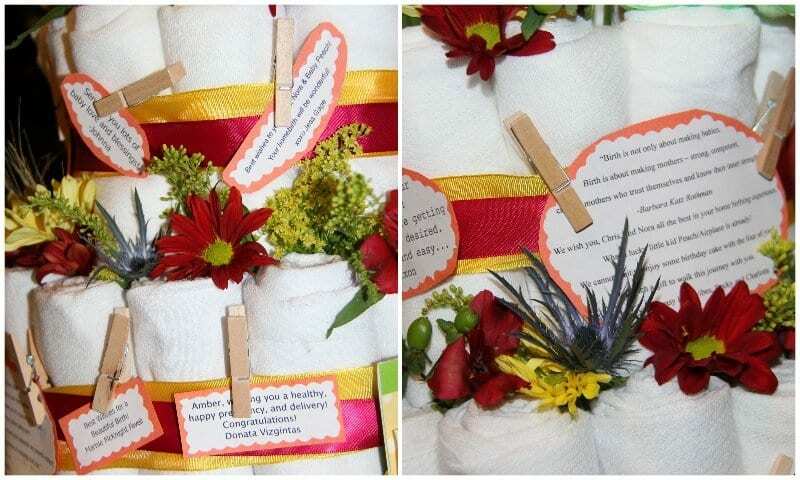 The three flowered layers were covered in notes and messages of love and support from friends who were not able to attend. Women from Nantucket to New York and Texas all sent love and blessings for me, Peach, our family, and a beautiful birth. And with their kind words, they sent a greater gift than Chris, Nora, and I could have ever expected: enough money to help us pay one-third the cost of our home birth. Yesterday, I sat down and tried to write this blog post and I was so overcome with gratitude that I could barely find words. Even today, I am near speechless. Not only do I have amazing friends on island who will spend time watching YouTube videos to learn how to make the perfect diaper cake, who will carefully select readings, music and postures to create the perfect motherhood flow in my honor, and who will come together to join me as a community of women, but I also have friends all across the country who understand how important this birth is to my family and are willing to help make it happen, even if it’s not the birth they would choose for themselves. As much as I loved Nora’s birth and as empowering and transformative as it was, I now know that the biggest thing I was missing from that experience was a community of women supporting me through each step of the way. Three years later, I have found that community across thousands of miles and I cannot be more grateful. Over the next couple of days, I will be writing notes of thanks individually to each person and family who has shown their love and support, but in the meantime, please know that Chris and I both thank you more than words can say. We love you all and can’t wait to continue sharing our homebirth journey with you. Namaste. So you were essentially begging to your friends for something that insurance would perfectly cover, just not the “experience” you would want? And what happens if, God forbid, anything happens during your home birth? You would then rush to the hospital and your insurance would pay a much higher cost to rectify problems created by your recklessness. Birth experince indeed! 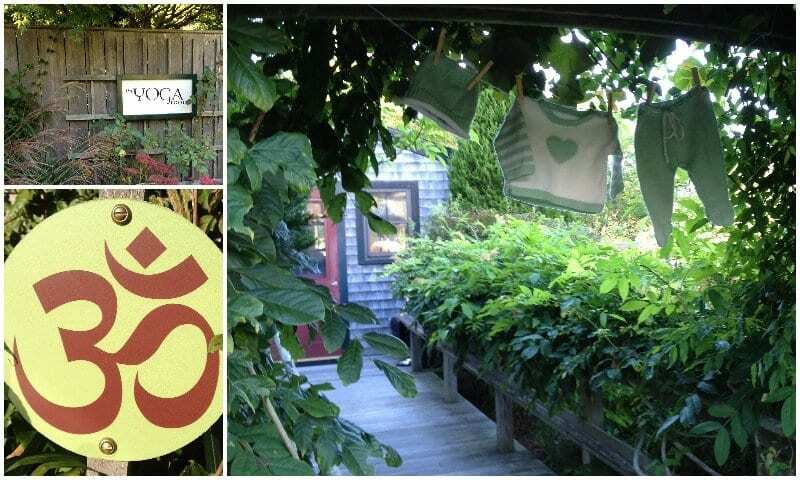 I am lucky enough to live in a community where my midwife has a free and open relationship with the hospital and my primary care doctor (there are no OBGYNs or CNMs on Nantucket), which means the best possible care throughout my pregnancy. Any complications that may arise prior to me giving birth will be easily identified and could very well change our birth plans; serious complications would not just necessitate a hospital delivery, but would actually require me to give birth off-island on the cape or in Boston. Due to the realities of island life, our hospital is not capable of immediately handling all emergent situations; it does not always have the staff or surgical space ready and waiting in case of birth complications and does not have a NICU (which is why high-risk women cannot deliver on-island). 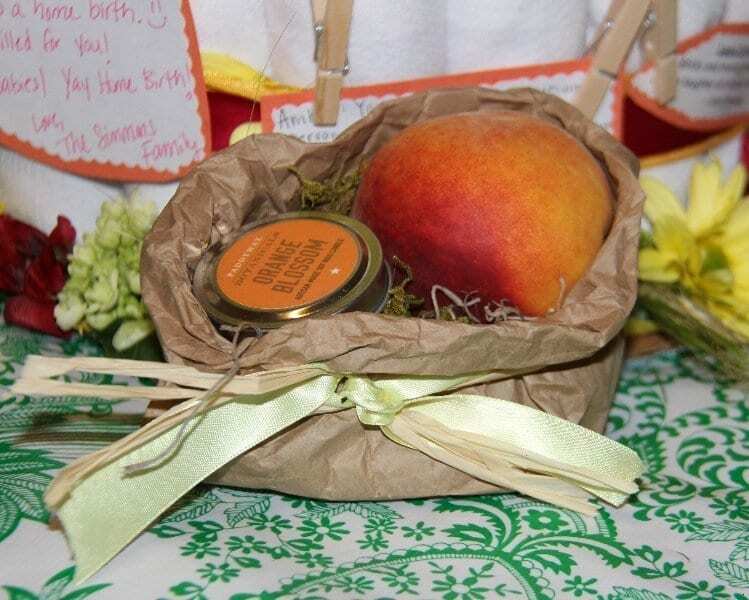 Thus, any complication that might arise during Peach’s homebirth would not be handled any differently from one that might occur if I were already in the hospital — the only difference being that, in addition to OR staff and anesthesiologists having to rush to the hospital for my emergency, I would too. (And it only takes 5 minutes for me to walk there, so I would likely beat the OR staff to the hospital!) I’m not sure why there would be any sort of cost difference based upon where the complication initiated, and research shows there is no increased likelihood of complications for homebirths over hospital births anyway. In fact, an updated Cochrane Review of all homebirth research, published last week, found that planned home births “can be as safe as planned hospital birth and with less intervention and fewer complications.” You can read the review here. That Cochrane Review is exactly why we want to have a homebirth. Do we want a better “experience” in a more comfortable setting with a caregiver who has spent a lot of time getting to know us and our desires? Yes. Do we want an “experience” that is more convenient for our whole family, including our three year old? Yes. But more than that, we want Peach to be born as safely and naturally as possible in an environment that greatly reduces the possibility of unnecessary intervention and cascading complications which can then result. Choosing homebirth is about more than experience — it’s about protecting something that has no business being treated like an ailment from turning into one at the behest of caregivers who are only able to view birth through one medical lens; it’s about choosing an environment that we believe will provide the best possible outcome for both Peach and myself. As far as my friends gifting me money to help defray our out-of-pocket cost, I’m not entirely sure how you see that as any different from someone being thrown a baby shower and being given baby care items, clothing, furniture, and gear. 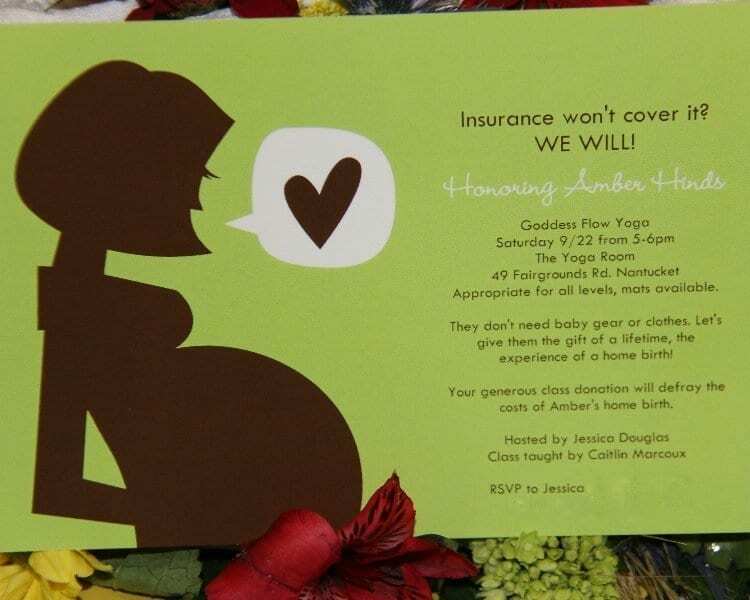 If someone throws a baby shower for one of their friends, are they begging for baby gifts? Yes Amber baby shower is begging for baby gifts. The difference between regular shower and yours is that you are dictating what is acceptable gift. That is why there are so few attendees at your shower and even with out of state friends and relatives and others joining in, you could only raise $1000. If you request others to finance something that you cannot afford, that IS begging. 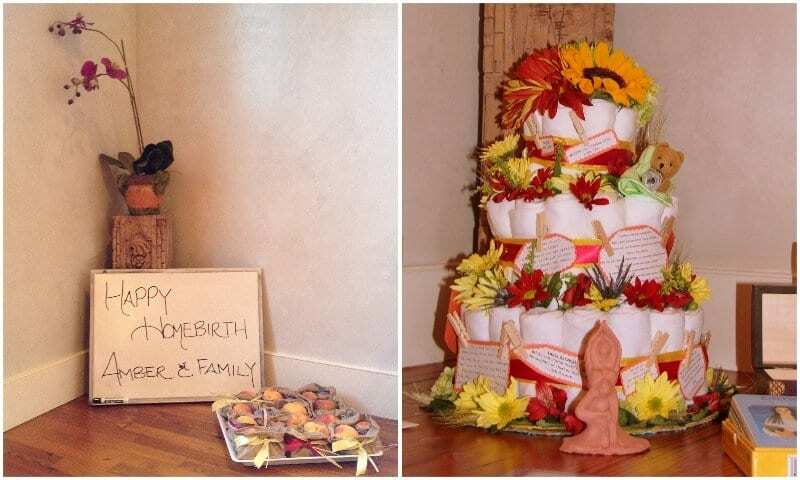 I just now saw this post and I am so thrilled that you are going to be able to have a home birth! I knew before I saw this post that you were going to be able to but I am so glad you posted this. Given I am so far away from Nantucket, I couldn’t come to the shower. Its awesome to see what was put together for you! Looks like it was right up your alley and lots of fun, I’m sorry we couldn’t be there! Sharon’s home birth was by far the most impacting event of our lives. I can’t wait to hear about your experience! ps. what a relief to share something unique and not built around giving the commercially influenced baby gear so many mommas get suckered into thinking they need.